- No pesticide! Easy install!Organic way to protect your fruit from birds and bugs. - Significantly reduce the use of chemical pesticides.Can be used to grow pollution-free crops. - Using this netting to give your garden's early sprouts a chance against the insects that feast on tender sprouts. - The garden net can basically block all kinds of insects, mosquitoes, pieris rapae, plutella xylostella, cabbage moth, prodenia litura, achillea, ape leaf insects, aphid. - Don't let your gardening efforts go to waste. Instead of shooing away pests and throwing your hands up in the air, throw up some nets instead. - Like a fence, This garden netting is an effective barrier that will repel most household birds,etc. - Material: made of see-through mesh cloth and 100% soft and stretchy nylon. - Package contains: 25 PCs 12"x8" Mosquito Bug Net Barrier Bag. NOTE: If you have any doubts, please contact us via Amazon. ☀EASY TO INSTALL☀Install in seconds with our easy use twist ties,Cover your fruit with the fruit protect bag, and tie to secure around branch or stem. This seals the opening of your fruit protection bag. Fruit protecting bags in bulk for your fruit trees . ☀Fruit insect barrier ☀Protect your apples, peaches, pears, persimmons, dragon fruits, guavas, oranges, plums, nectarines and other fruits from mediterranean fruit flies, birds and bugs. ☀Great for all growing season☀It help to prevent the damage from the frost, and keep the temperature and moisture more stable for the fruit. so it can be used everday in year. ☀Perfect protection☀Protect your plants, vegatables, flowers from Insect, Mosquito, Bug, Bird. In addition It can be used to pack plant seed or storage other little things. View More In Garden Netting. 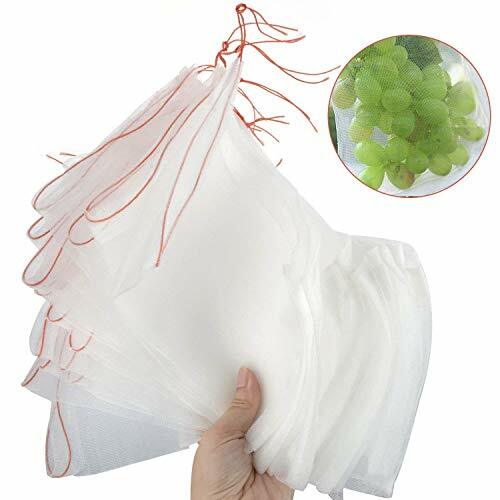 Pannow 100Pcs Plant Protect Bag, Garden Netting Bag Insects Mosquito Bug Net Barrier Bag Garden Plant Fruit Flower Protect Bag, Mesh Netting Bags - White 6" x 10"